So I should probably be writing about swine flu or government jets buzzing Manhattan, something vital and current. But you know what? At the end of all the debates and anxiety, you still have to eat dinner, and unless you’re enjoying an AIG golden parachute, that means cooking at home. What are you going to have? These are some of the recipes in heavy rotation at my house, all highly recommended. SO good! We have them with veggie burgers about once a week. First, take a half-sheet pan and throw it in the oven as it preheats to 425 degrees. Then chop a couple of sweet potatoes into fry-shaped pieces. No need to peel first; in fact, they’re better if you don’t. Then toss the fries with 2T olive oil, 2t chili powder, 2t salt, 2t pepper, 1t dried oregano, 1t dry mustard, and 1t paprika. Put them on the hot sheet pan and spread them out so they can get good and crisp on the outside. Bake 25-30 minutes. Incredible! Especially delicious with some fine barbecue sauce (I recommend this). Not even vegetarians actually get excited about tofu. But it’s damn good protein, and this preparation is delicious. First, slice a block of extra-firm tofu into four pieces. Place them between a couple of cutting boards lined with paper towels (or even better, clean tea towels) and drain the tofu for a couple of hours (or whatever time you’ve got). While that’s going on, mix up your marinade: 1T sesame oil, 1T canola oil, 1T mirin [go buy mirin! you won’t regret it], 1/2T soy sauce, 2t Thai chili paste, 1 clove grated garlic, 1 clove grated ginger. 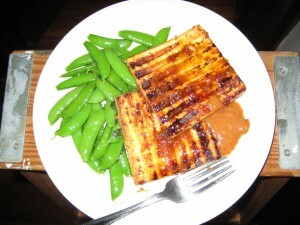 Soak the tofu in the marinade for as long as you can, and then grill the hell out of those bad boys. Serve with peanut sauce and fresh veggies. You will love it. This one is dead simple and plates up nice and fancy. While the oven preheats to 400 degrees, mix up the following: three chopped fresh tomatoes, 2 diced shallots, 2T olive oil, juice of half a lemon, 1.5t chopped oregano, 1.5t chopped thyme [halve the herbs if you’re using dried], 1t salt, and 3/4t pepper. Add a few drops of olive oil and a serving of salmon to a sheet of aluminum foil. (This recipe is for four servings.) 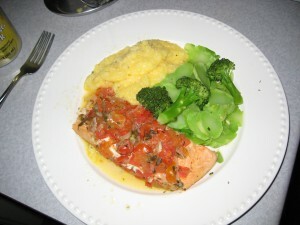 Divide the tomato mixture evenly among the servings of fish, and seal up the foil into tight pouches. Bake 25 minutes. The salmon will steam in the tomato-y, shallot-y juices and will blow your mind. Goes well with polenta. So, what are your kitchen staples? Ok, I find all those foods totally nasty, but your presentation is an A+. The sweet potatoes seem the least nastiest, so I would eat them. Tofu is the next on the list, and your picture and description even make that seem alright. The next two are difficult because I don’t eat any fish or seafood, but the recipes sound good and your presentation is superb. Good job Ms. Berkowitz. My kitchen staples are currently Ramen and cheater Stroganoff, so you know where I’m coming from. And they say Porland is a culinary town. Nasty? For real? I guess a lot of people don’t eat fish, but you could probably put that mango-radish salsa on chicken or whatever. And who doesn’t love food cooked in a pouch?! Try something besides salmon. Maybe the next food post can be about cake and ice cream. Most people like those. Now that I think of it, respecting everyone’s food restrictions is very tricky. All the more reason to say what you’re eating right now! p.s. what is cheater Stroganoff? Everything looks delicious to me! 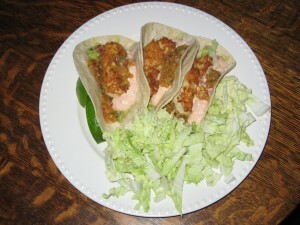 A friend of mine just reviewed fish tacos (in L.A.) on his blog, LA Food Crazy. I wonder if your recipe is better…. I’ll have to give it a try. And that tofu looks especially good. Here is what we cook often at our house – cheap and nutritious. Chop up a small onion and cook in olive oil until transparent. While the onion is cooking, add chili or cayenne, salt, pepper, oregano, cumin, and whatever else sounds good to you. Right before you add the beans, put in a few cloves of crushed garlic. Add a can of black beans. Let simmer for about ten minutes, then add some red wine. Let that simmer all together, stirring on occasion, scraping up the bits from the bottom and sides of the pan. Cook until the beans have thickened. Rice: cook up some white rice. Plantains: Go down to your local Salvadoran mercado and pick out the blackest, softest plantains you can find. If they don’t have any ripe ones, go across the street to the other mercado – they usually have better ones anyway. Bring them home and peel and slice them into 1/4″ discs, then fry them up in hot corn oil until brown. Serve the black beans either over the rice with the plaintains alongside. 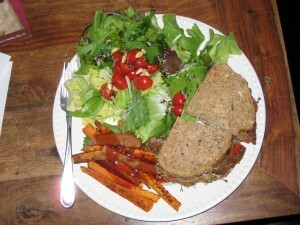 Add a salad on the side as well if you’ve got the time to make one. Yum! If by “nasty,” Mark means that those dishes look good enough to want to devour them all right this millisecond, then I agree. My stomach is growling. Um, I actually do get excited about tofu. Ah, there’s an exception to every rule. Do you have any favorite ways to make it? I love sweet potato fries! I can’t wait to try out your seasoning recipe. It all really does look delicious, but maybe it’s because this is like restaurant food to me–tasty, yet something way too complicated to make at home without going through all sorts of effort. Okay, so inspired by this post and wanting to save Amy’s Spinach Pizza for another night, I made an amalgam: fried up some whitefish, cooked some polenta, made a topping out of a tomato and some garlick fried up lightly. It’s kinda yummy. Oh, and I got a pizza. How embarrassing. But yay Dave! #3: I am all over those plantains. Sounds terrific. 1: it seems like if your kitchen staples are ramen and cheater stroganoff, that any direction of change would be an improvement. but what do i know. rachel, in response to your question about kitchen staples, tonight i made one of our favorite simple middle of the week meals, which i fixed up a little in honor of a much anticipated visit from a west coast greatwhatsitter. and they serve themselves whichever of these options they want onto their plate, and then eat using the nori as the utensil. kind of like using nori as injera, the wheat pancake used to eat ethiopian food. on a normal night we will just have two or three options (usually rice, greens and tofu, say) but tonight we went all out and had them all. it’s a fun family style meal. sorry i didn’t think to take any photos. p.s. autumn, you are awesome!! welcome to philadelphia!!! i forgot to say all of your dishes look delish! Autumn + the Trixie household: there’s a group I’d like to be among. Trixie, that spread sounds downright fresh and healthy, plus feastly. I can’t wait to try that one too. As a sushi addict and a person strangely drawn to Asian foods, I am a big fan of Benihana. I watched the way the chefs prepare steak and fried rice (the old way, before they changed the menu, which I hate) and tried making a bit healthier version at home. It came out delicious. In a wok, cook small pieces of chicken breast in sesame oil until golden brown. Add tiny chopped carrots, zucchinis, onions, and a little garlic (not to overpower), cook until the vegetables are 3/4th done and the onions are caramelized enough to add sweetness to the dish. Add salt and pepper to taste. Add lite soy sauce, “I can’t believe it’s not butter”, and a dash of crushed red peppers. Let the ingredients mix and give out their flavor before adding rice. Add rice (I found that Basmati rice tastes amazing in combination with all the ingredients, because it naturally has a rich and heavy flavor, but brown rice would be healthier) Stir for a few minutes. Add scallions (not too soon or they will wilt) Meanwhile, cook a couple of eggs next to the rice, sunny-side-up then scramble and cook until ready. (It’s important not to scramble the eggs right away, because they will give the dish a rubbery taste). Once the eggs are cooked, add them into the mixture. Garnish with sesame seeds. Steak goes best with this fried rice. When you have guests over, it’s fun to put on a show while cooking steak and tilt the griddle pan just enough to catch on fire for a few seconds. A burning pan looks incredible, plus it gives the steak a bit of a smoky flavor (please, don’t try this at home, if you’ve never done it before, start outside and practice on a barbeque burner) The grand finale is, of course, an onion volcano. Hide all the forks from your guests, because it’s blasphemous not to use chopsticks with Asian dishes. Trixie, I am going to make this ASAP. I love the idea of “deconstructed” sushi. Homemade sushi always seems way too overwhelming, but even I can handle prepping all these ingredients and leaving the assembly to others. Also, it’s a great excuse to eat more nori! yes, deconstructed sushi is a much more clever way to phrase what this dinner is. Cheater stroganoff is ground beef, cream of mushroom soup, and sour cream. I don’t know what’s exactly in the real stuff, but that’s how dear old mama made it.